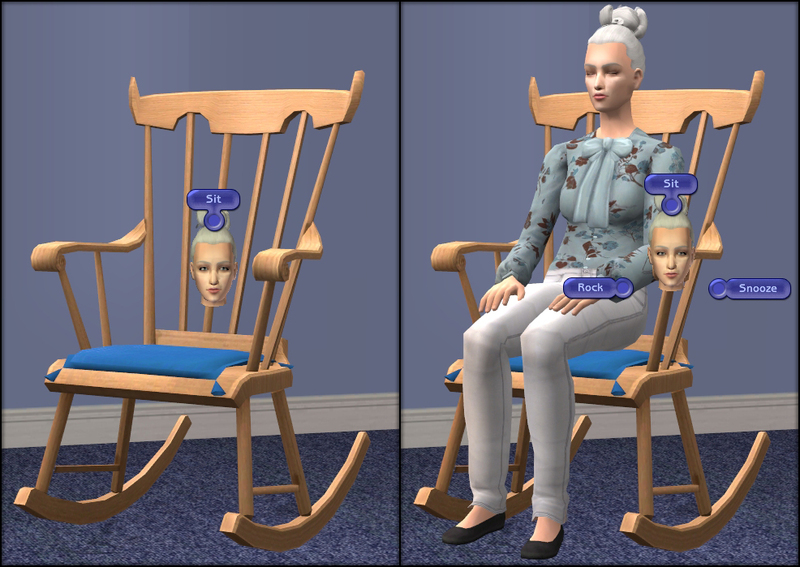 The lovely Honeywell tweaked my mesh to disable autonomy on the rock interaction, which should prevent sims from rocking the rocking chair while sitting in a different chair. I've updated the attached file with the non-autonomous version - let it overwrite the original. A shinier, newer version which allows autonomous rocking only when the sim is actually sitting in the rocking chair will arrive at some point. 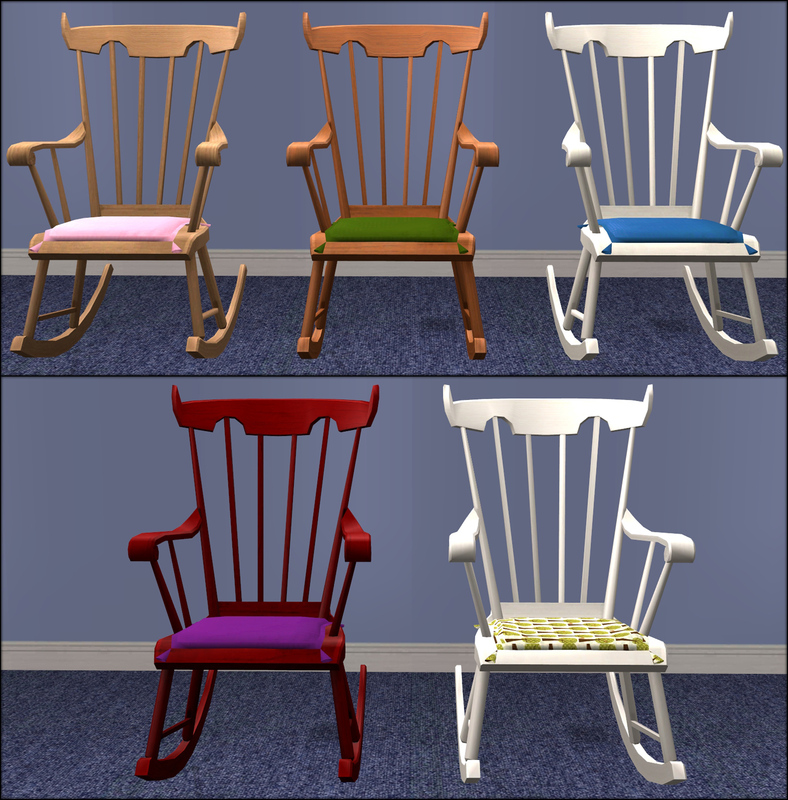 A while ago Honeywell posted a lovely converted rocking chair from TS3, with a custom snooze interaction. Shortly thereafter, rebecah animated it using an animation by -Maylin-... but also took out the snooze interaction, and retextured it. I wanted the best of both worlds, so here it is! It's called the Time Wimey Rocking Chair Deluxe, and can be found in Seating/Livingroom and Misc/Kids, for §350. Sims can sit, rock or snooze in it. Rocking increases comfort and fun, while snoozing increases energy. It's usable by children to adults. There are five of Honeywell's original wood colours, which you can see in the attached pic, and the cushion is slaved to the crib bedding. Because this version is intended as an upgrade and replacement for Honeywell and rebecahs' objects, I didn't change the GUID, so you have to choose between rebecah's version and mine. If there's interest in having both I can change that. I tweaked the motive constants, so the snooze interaction now restores more energy. It's perfect for a nursery, since the poor sim will be woken up if a sprog starts to cry. You can see Pell Mel snoozing in the first pic above. The options to rock and snooze will show up once your sim is sitting down. To stop rocking, just cancel the interaction. Many thanks to Honeywell, rebecah and Maylin for their lovely policies (or permissive lack thereof). Thanks also to HugeLunatic, who provided a solution to an MMAT problem in an old post, and to celebkiriedhel who offered to try to fix the object for me if Lunie's solution didn't work! These recolours may or may not be endorsed by Nysha.